One of the favorites of the Summer Games is the swimming events. Why Summer Games now? Because the torch starts making its journey in the spring. 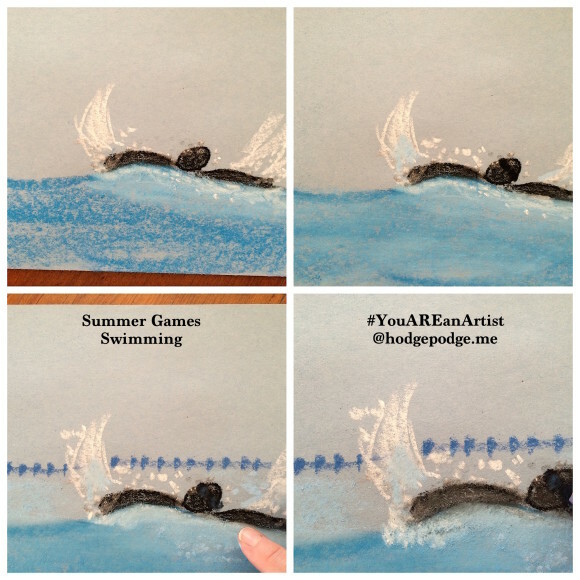 This Summer Games swimming chalk art tutorial is a representation of a swimmer in motion. Imagine the Olympic ‘stick figure’ swimmer and that is what you will begin with. 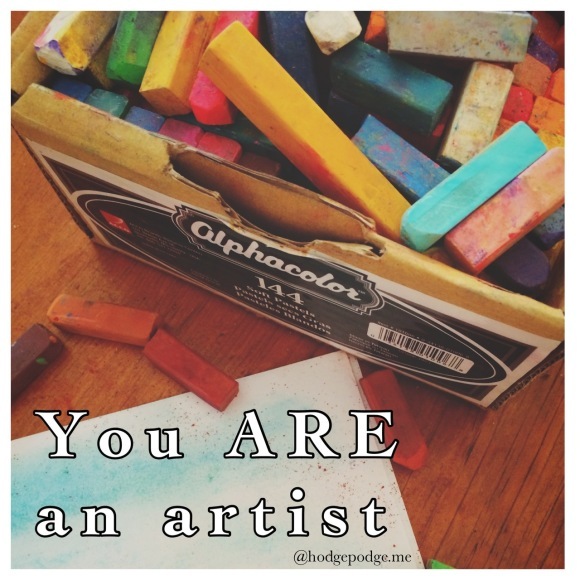 Chalk pastel supplies needed: Black, blue, light blue, light pink or peach and white chalk pastel sticks. Light blue construction paper or plain, white printer paper. Turn your construction paper horizontally to begin your swimming pool. Now your swimmer is fast and is already on the far right of your paper. You can place your swimmer first and then surround him with water. Use your black chalk pastel stick to make a simple, round head and then long arms. One arm reaching forward in a stroke and one arm behind. 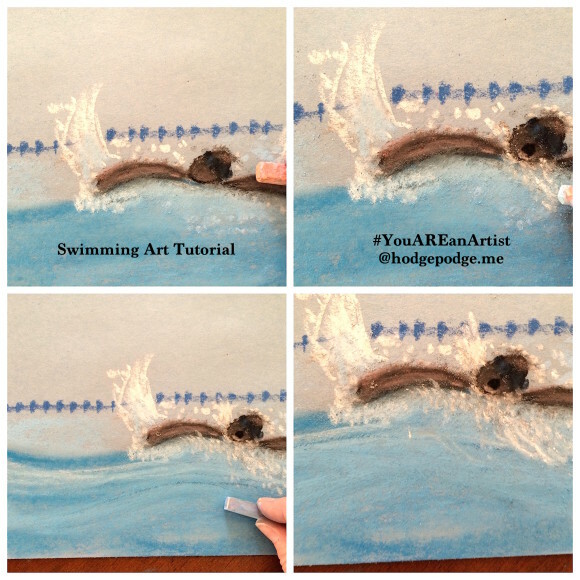 Fill in your swimmer with black and then smooth in the color with your finger tip. Next, turn your brilliant blue on its side and skumble in the color of the water. This water is in motion from all the activity of the Olympic race. So be sure to add some smooth waves. 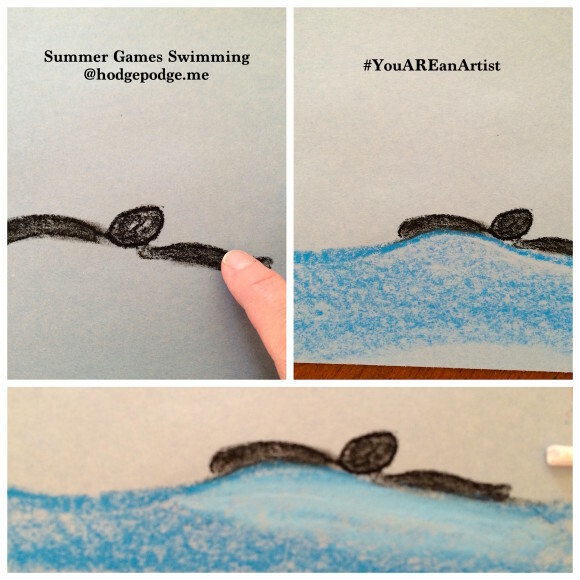 With your lighter blue, add a bit of depth – just under your swimmer. The light from above may be shining down but also the splashing causes this part of the pool to appear lighter. Fun splashes are next, using your white pastel stick. Because of the speed your racer is going, the white splashes of water naturally spread in front and in back. Make these extend from each swimming arm. Then take your white pastel and dot, dot, tap, tap, tap in some water droplets landing all around. You might blend then add some more splashes, layering until you are pleased with it. At this point you may want to add either a pool lane marker or what looks like the side of the pool. Simply a blue line all the way across. Then little circles for detail. Now your swimmer will wear goggles. So take your blue chalk pastel and draw in the googles. Not much detail, just enough to notice. The light pink pastel adds just a little depth to your swimmer’s skin. Just a touch of pink helps to catch the lights from the Olympic swim stadium and the reflection of the wet arms chopping through the water. Finish up by using your light blue and maybe a little white to work on the pool water. You can make it realistic by adding these layers of color. Little waves and reflections of light because you ARE an artist! 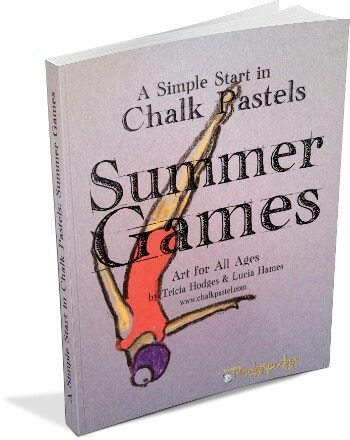 Our newest A Simple Start in Chalk Pastels: Summer Games! New! 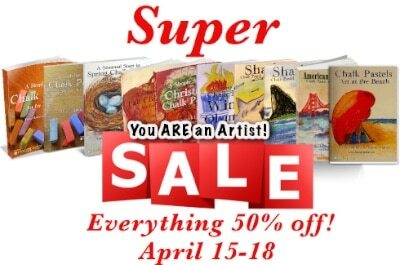 Summer Games Chalk Art for All Ages – 50% off the WHOLE STORE for a short time! 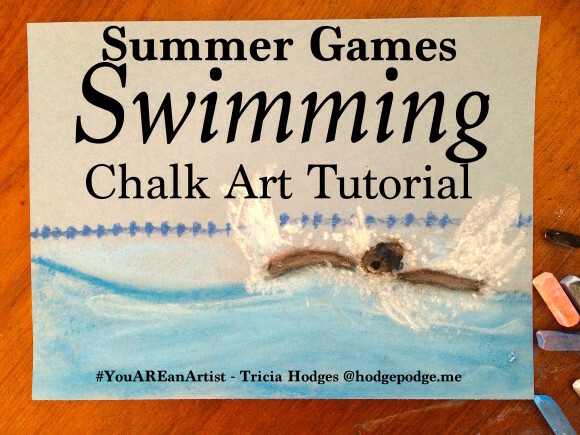 Summer Games Coliseum Chalk Art video tutorial – can you just see the athletes?